The late patriarch ruled his Church for 40 years. Spirituality, vocations, participation in rituals have increased, but ecumenism and lay involvement slowed. Skirmishes on intermarriage with Catholics. Nationalist and anti-Israeli, Shenouda clashed with Sadat, who imprisoned him. An alliance with Mubarak to build new churches. The urgency of the mission in society and in defense of women. Egypt caught between a military dictatorship and fundamentalism. 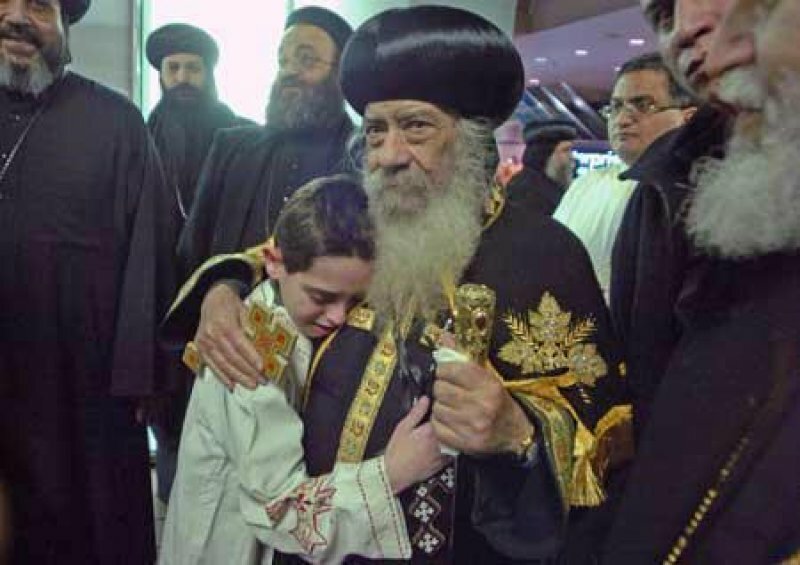 Beirut (AsiaNews) - The death of Shenouda III, head of the Coptic Church for more than 40 years, leads me to take stock of the life of this Church, its relations with other churches, with Islam and Egyptian policy . Shenouda III, born Abnub, Asiut province on August 3, 1923, named Nazir Gayyed Rufa'il, studied history and archeology at Cairo University and theology at the Faculty of Theology until 1946. He taught there for several years, and in 1954 entered the monastery of Suryani (Dayr al-Suryan) which is in the Nitria Scetis desert, about 120 kilometers from Cairo on the road to Alexandria. This monastery is linked to that of Deir Anba Bishoy (Monastery of Abba Bishoy). As Patriarch, Shenouda went on to choose all the bishops of the dioceses of Egypt from these two places. In 1962 he was appointed Bishop of Ecclesiastical Studies by the 116 ° Patriarch Cyril VI, and he took the name Shenouda. Finally, 14 November 1971 the synod elected him patriarch of the Coptic Orthodox Church, a year after the death of Gamal Abdel Nasser in September of 1970. In fact, the patriarch in the Coptic Church is always a monk, as well as a bishop. And when choosing a layman to be a bishop, he must spend a few months in a monastery, before being ordained a bishop. As patriarch, Shenouda governed both under Sadat and Mubarak. During these years he has given a very strong spiritual impulse to the Coptic Church through his weekly general audiences which lasted for almost 40 years. Every Wednesday there was an audience for more than an hour with questions and answers, and discussions with the faithful. Each time there were several thousand attended. Later, these were recorded on video and cassette and broadcast by the mass media. He is also the author of 50 books that touch on all religious questions, from a spiritual angle. He was a monk who knew the tradition and the Bible by heart. He could quote chapter and verse. He knew the spiritual literature and monastic life of the saints, drawing on them in abundance in his sermons and writings. It was not a theologian, with an advanced research in the fields of dogma, but he made a major contribution to spirituality. He also contributed to a renewal of the dioceses, founding many new ones and downsizing exisiting ones. This allowed the bishops to have more daily contact with the faithful for a more effective ministry. At the same time, some people think that this was a move to elect and consecrate several bishops who were his supporters for a majority in the Coptic Synod. His fame as a bishop was already great, it then grew with his election as Patriarch ("Baba Shenouda"). I met him when he was bishop: we worked together in the World Council of Churches for Middle East (MECC). We always had a very good relationship, even if we did not agree on everything. I was also in charge of the "Ecumenical Youth Service" (YES) for young people of different denominations throughout Egypt. The Patriarch loved to come for all occasions. To the very end, our relationship was direct and friendly. He would say to me: "You are young, you're like my son, hear what I have to say ...". He had great respect for my studies on the history of the Church, though - he said - "we should not implement everything that is in the tradition." His views were constructive, very respectful of the difference between us. Perhaps this is due to the fact that I did not belong to the Coptic Orthodox Church. Within his won community, however, he was known for his authoritarian decisions. This policy has however led to a strengthening of the formation of the faithful in Egypt. Having consecrated very young and learned bishops (35-40 years) all his disciples, he could spread his vision across the country. With the laity the situation was more delicate. Shenouda was conscious of having the responsibility of all the Church and thus some of the laity were humbled. During his patriarchate vocations to the priesthood and religious life multiplied. He expanded the pastoral care of students, asking young people to always have a spiritual director, and to practice confession. The practice of communion was also widespread, but only after confession. Sometimes there were priests who before giving Communion to a young person, would ask him whether he had confessed and with whom ... He has done so much for spirituality and devotion in the Coptic Church, increasing the practice of the Sunday liturgy. Relations with other churches were more problematic. He was never very warm towards the Protestants. He said that "we must learn from the Protestant Bible study," but was always wary of collaboration. His relationship with Catholics was better. In 1973 he visited Pope Paul VI and even signed the first official document of agreement between the Catholic and Orthodox Church, in which it was agreed not to carry out mutual proselytism. Proselytizing is an accusation that the Orthodox Churches have often made against Catholics. The agreement provided that if there were any cases, Shenouda would call Rome, which would intervene to remedy the situation. Once, in Upper Egypt, near Dayrut, in an Orthodox village 300 km south of Cairo, forgotten for years by the Orthodox bishop, they threatened him: "If you do not come, we'll become Muslims." But before they came to the Catholic church in the village nearby and asked to become Catholics. The priest and the bishop of the diocese of Asyut discouraged them, exhorting them to remain Orthodox. At a renewed threat that they would become Muslims, the bishop relented and sent a Catholic priest to the village. This fact, however, caused problems between Shenouda and Rome, which led to an agreement: the Orthodox would find a solution for the village within six months. After this period, if nothing happened, then the faithful - at least some of them - would enter the Catholic Church. In itself there was no desire to proselytize, but only the desire to help these Christians, who otherwise would have become Muslim. Things got worse between Catholics and Orthodox after a few years after his election as Patriarch over the rules he imposed on mixed marriages. In the east marriages between Orthodox and Catholics are common and do not raise problems in families because the faith is common, despite differences in the rituals and traditions. The traditional use, throughout the East, is that marriage is celebrated in the church of the groom, the children follow the tradition of their father, but it is possible that agreements are made between them. In any case, the two parts remain in their Christian confession. Shenouda decided that if there were mixed marriages, the Catholic party had to be re-baptized into the Coptic Orthodox Church. In practice, the Catholic means Catholic women. His theologian, argued supporting his position for a while, has pointed out that patristic tradition does not provide for a new baptism, but he, stubbornly, kept this rule until now. It must be said that his priests are often more open than he. He was a conservative regarding ecumenism and did not make much progress toward unity among Catholics and Orthodox. In 1984 he also criticized the Syrian Orthodox patriarch, Zakkha Iwas, because he signed, on June 23, an agreement with the Catholic Church (with John Paul II). The joint statement that it resulted in, was very advanced: it provided freedom in marriage, communion with one another and even shared formation of priests, and even today many Syrian Orthodox priests study in Catholic seminaries and theological faculties. When Shenouda heard about this agreement, he criticized Zakkha, for having dared so much, without first consulting him. It should be noted that the Syrian Orthodox, Copts and Armenians are joined by a bond because they are pre-Chalcedonian Churches. His Beatitude Zakka told him that their churches are sisters, but independent. In addition, he noted that the same Shenouda had signed the 1973 agreement with the Catholics without consulting the other two churches. In the relationship with Islam, Patriarch Shenouda made a lot of meetings with the Imam of Al Azhar. He knew the Koran and the Arabic language: he even wrote poems in Arabic. He could deal with the Muslims, without cedine ground on the dogmatic aspect, he was rather careful not to provoke Muslims. Although attacks against churches and killing of Christians and fundamentalist violence continued during the period of his government, he managed to maintain cordial relations with the Muslim world, but without compromise on important issues. Relations with the State have always been very delicate. He became patriarch under Anwar Sadat. From the political point of view, Shenouda had a very clear position on relations between Egypt and Israel. He was always against an agreement between the two countries. When Sadat went to Jerusalem, he gave his speech at the Knesset and launched diplomatic agreements, Shenouda condemned this policy. Perhaps this move had tactical reasons: the Coptic Church is a minority (it does not exceed 10% of the population) and Muslims increasingly view Christians as allies of the West (and Israel). His decision allowed him to escape the cliché, in alliance with a powerful anti-Israeli lobby, still present in Egypt. But Shenouda's position drove Sadat to put him under house arrest in the Anba Bishoy Monastery in the Desert (Wadi an-Natroun) for four years, from September 1981 until the death of Sadat (assassinated October 6, 1985). Sadat even imprisoned some bishops for the first time in the history of Egypt, in a tense situation that lasted almost a year. In addition, in order to rule, Sadat garnered support from the Muslim Brotherhood, increasingly tough on Christians. We can say that the whole Sadat period was very difficult for Shenouda. When Mubarak came to power, 31 years ago, the situation changed. The patriarch supported the president and vice-versa. The two made a personal agreement that lifted the ban on the construction of churches. In Egypt, by law, a church may be built only if they comply with 10 rules. But they are so stringent that it is virtually impossible build any. The pact between Mubarak and Shenouda the agreement provided for a certain number of church buildings each year. When it was made public it was criticised by Muslims, but nothing more. The agreement, however, presupposed that the patriarch would support all decisions by Mubarak. When the Arab spring broke last year, many Christians were in Tahrir Square. But the Patriarch was reluctant to support the movement, because it became increasingly anti-Mubarak. The problem of Christians in the Middle East is always this: caught between two fires, between a dictatorship and fundamentalism. Our situation in the Middle East has always been weak and the Coptic Church is an illustration of this: unable to envisage prospects, initiatives, to engage in society and politics. The Coptic Church is often closed in on herself, living in a ghetto to protect themselves and live in peace. They do not try to change society for fear of not succeeding, being a minority. In the past it was different, 50 or 80 years ago it was much more alive. Then, becaus eof teh deteriorating conditions of freedom, we hid in our monasteries, in prayer, in the Church's inner life. Now, with the Arab Spring, we are in a moment that has aroused so much hope of freedom for Christians and Muslims, in rejecting a theocratic regime. Unfortunately it seems that we are returning to where we started from. The other problem is the Egyptian army. The army controlled Egypt since the days of Nasser, for at least 60 years, and does not seem to want to relinquish power. Even now they decide everything. Egypt is at a delicate crossroads: it could become a military dictatorship or a fundamentalist regime. Precisely for this reason, many Christians hesitated during the revolution. Among the Coptic bishops there are very good personalities, who could take over the leadership of the Coptic Church. Among these would I exclude Shenouda's deputy, who was an executor of his decisions, but lacking in personality. The Coptic Church remains strong in spirituality, in liturgical prayer, fasting. The Copts have almost 200 days of fasting a year. And their fast means that they do not take anything, no drinks, no food from midnight until the earlier of 3pm the next day. And their meals are very light. This fast, lived in union with Jesus Christ, strengthens the faith and the strength of the Copts, to be able to resist in their identity. The Copts do not show that they are fasting, but when Muslims realize this, they were surprised in a positive way. The food is vegetarian, then, eggs, cheese, milk, etc are also excluded. It must be said that somehow this religious testimony of the Copts impresses Islamic people who often delineate the West and Christians to atheism. After the Arab Spring, we are at a new stage that needs new choices. Within the Coptic Church more freedom should be given to the bishop, priests, laity: they need a united but not dictatorial voice. They also need to engage more in society, for the common good, politics, human rights. Coptic Christians are not opposed to this, but do not promote this. But Christians have a very important function, especially to restore dignity and value to the woman, who in Islam are often humiliated. The relationship with the Muslims should be more active and vibrant: you can not live side by side, without asking any questions. For example, in Egyptian society Islam is publicized on the bus, in taxi. Christians must ask Muslims to build a society that leaves room for all. Another dimension is mission. In Egypt there is no mission because of sociological conditions: Islam does not allow evangelization. But an urgent and explicit testimony that would be good is working together with other Christian denominations. We have a few: divided we are weakened even more. Finally, we can only pray to ask God to illuminate the Holy Synod to elect a successor strong in faith, open to the world and its needs and attentive to the needs of the weakest in society at large.